Posted on January 20, 2016 at 10:12 am. There have been five new pokies game releases from various software providers at Guts Casino in the past few months, and we have all the information you need to know right here. Net Entertainment’s latest release only went live this week (January 14), though it was available exclusively at Betsson online casino since April 2015. Glow is a 5 reel and 15 paylines pokie based on the stunning Northern Lights (Aurora Borealis). NetEnt haven’t skimped out on features to simply create a pretty pokie, rather they’ve included a Wild symbol which doubles wins after completing paylines, as well as free spins on winning spins, and a Free Spins feature with multipliers and Wilds. Play Glow on mobile and desktop devices at Guts casino. Quickspin released their new pokie, Second Strike, in late December. 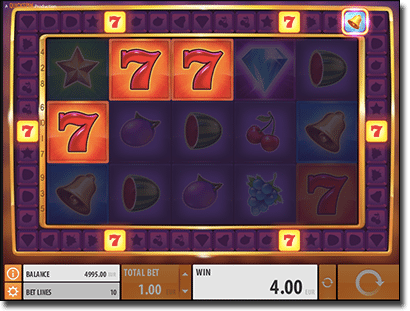 The 10 payline pokie is based on traditional fruit machines, made so with the inclusion of the classic fruit symbols. However, it has been modernised thanks to the inclusion of a unique feature where symbols are added to the reels when the marker on the outer reels stops on a symbol to initiate a win. If you activate this feature you will score six to 10 symbols added to the reels and this will create a big win. Second strike is available on smartphones, tablets, laptops, and desktop devices at Guts casino. Microgaming released their new pokie when we were busy stuffing our faces with Christmas lunch in December so you’re forgiven if you’re yet to try this unique addition. Featuring 5 reels and 4 rows, the pokie initially has 40 paylines in the base game, but this transforms into 1024 ways to win once you’ve activated the Free Spins feature. This is done so by collecting gems (spinning a winning gem combination) and filling the StarDust metre. After you’ve collected 10 you will be rewarded with 10 free spins. There’s also Radiant Re-Spins where the last two reels re-spin on a three symbol win, as well as Super Stacked Wilds. StarDust is only available on desktop devices at www.Guts.com. Play’n Go released this new beauty when everyone was kicking off work in December and only playing the Xmas themed pokies. 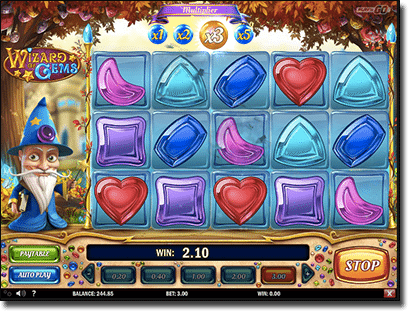 Wizard of Gems features 5 reels, 3 rows, and 20 paylines, and is based on a wizard and his beautiful gems. Collapsing reels, or gems, see a winning combination of gems disappearing and new gems falling in their place to create a mini Re-Spin. Then on every consecutive win from here an increasing multiplier will occur, from 1x right up to 5x. 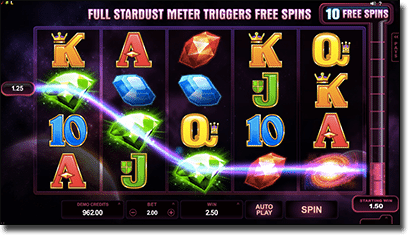 There are initially 10 free spins available by landing three Scatter symbols but players can earn up to 50 by re-triggering the free spins feature. Wizard of Gems is available on mobile and desktop devices. Launched in late November, we are going back a bit now but with all the festivities and brand new christmas themed pokies this one went under the radar. Developed by BetSoft as a new addition to their Slots3 line, the 5 reel and 243 ways to win pokie offers an incredible cinematic experience. We follow a wizard name Alkemor who teleports us to multiple rounds – as all BetSoft titles offer – including the Nature Free Spins mode and the Celestial Free spins mode. There are also an array of bonus features including the Elemental Water Spell, Elemental Fire Spell, Elemental Earth Spell, and the Elemental Air Spell bonus rounds, where you are guaranteed to win big thanks to special Wilds here – view the paytable for specific instructions on each. If you aren’t a member yet at www.Guts.com, follow our links to sign up and get spinning all the new and unique pokies from some of the best software providers available.